This page contains the end of Book II and the beginning of Book III of a treatise by St. Augustine against heretics. 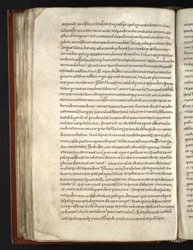 The manuscript was written in France early in the early 9th century, perhaps in the Paris-Beauvais region, but it had reached England by the late 11th century, when two copies were made from it (one is now in Oxford, the other in Salisbury Cathedral library). By the late 12th century it was at Burton-on-Trent, when a list of Burton Abbey's library books was written on the final page.